I designed a storage unit of my own and it has worked out perfectly for me. There’s nothing more enjoyable for those of us who love the outdoors than camping out beneath the stars in the wilds of nature. But sometimes, a tent is inconvenient or just plain uncomfortable, and an RV is a hassle and just too expensive. So what do you do when you want to camp but don’t want the hassle or expense of other more conventional methods? 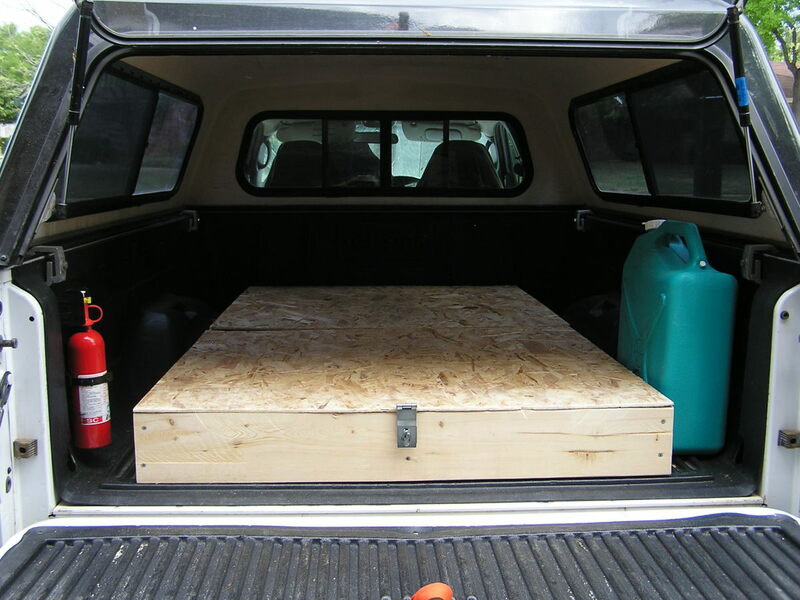 Well, you build a handy dandy truck bed platform with built in storage, that’s what you do! That’s what I did and here’s how. 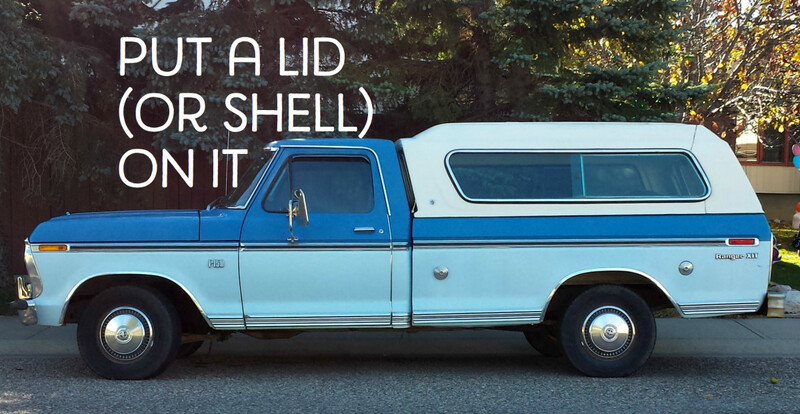 Most outdoor folks have a pickup truck and some even have a camper shell on the truck. 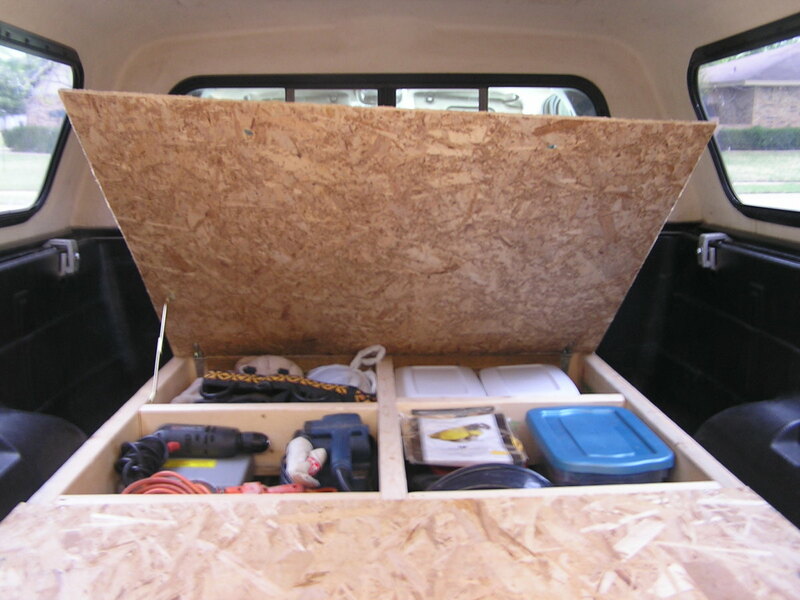 But packing the truck with all the necessary items for camping while maintaining space to sleep in the bed of the truck is a test of gear management. 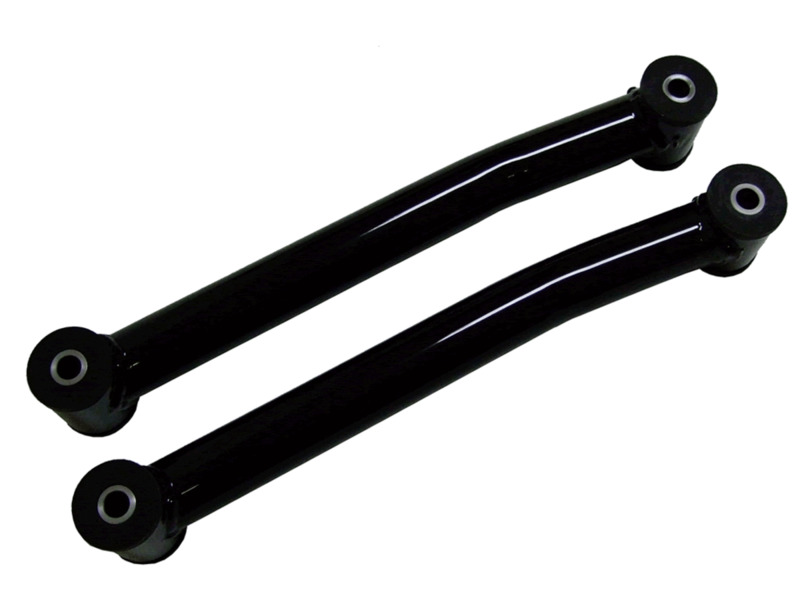 I struggled with this problem through the course of owning a few different trucks. I searched for pre-made options and then searched for homemade options but found nothing to fit my particular needs. So, I designed a storage unit of my own and it has worked out perfectly for me. Storage platform closed for sleeping. 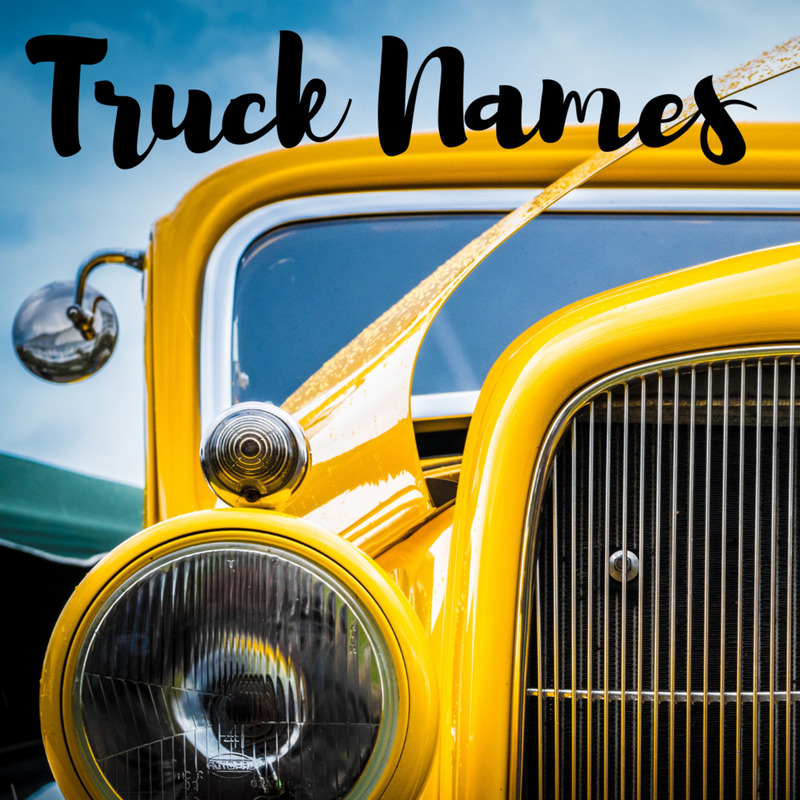 This idea will work for any pickup truck, but due to truck bed sizes and other factors, modification will be required. 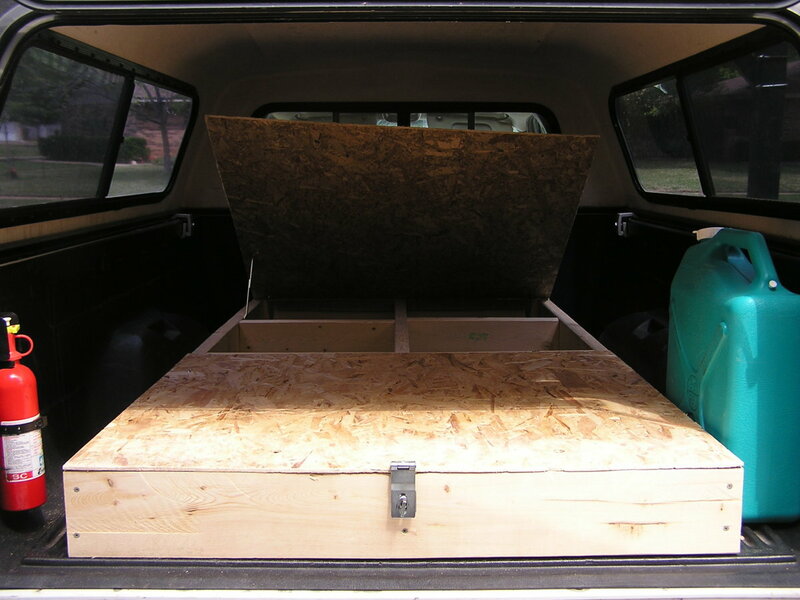 I built my truck bed storage and sleeping platform for my 2000 Dodge Dakota. I will leave measurements out since those are different for the different truck beds but you’ll get the point. For this unit and using the simple tools I already owned like a circular saw and drill, I used four 2x6x8 pieces of lumber (I used 2x6 instead of 2x4 to give more height and room inside), one 4x8 sheet of approximately 1/2-inch plywood, a box of wood screws (any size will work as long as you have enough length to make a solid bond), four hinges, and two lock-out hinge arms to hold the platform doors up. First, I measured how long I wanted the unit to be, which was almost the whole length of the truck bed (from truck cab to tailgate) stopping just shy of the tailgate. I cut three 2x6 boards to this length. Then, I measured how wide I wanted the unit to be. It had to be shorter than the actual width of the truck bed since this was to fit inside of the wheel wells. I attached the boards together with screws (two screws for each joint) to basically make a box. Then, I cut 2 pieces of 2x6 and attached them with screws inside the box to make a box with 4 compartments. After that, I cut 4 more pieces of 2x6 to create a box with 8 compartments. You’ll want to look at my pictures to get a clear picture of this. Next, I measured (remember to always measure twice) and cut the plywood to fit the top of the box. Then, I cut that piece in half to create two separate doors, a top half to cover 4 compartments and a lower half to cover the other 4 compartments. I attached the doors to the box so that they would open toward the tailgate. I cut two 2-inch holes in each door to serve as finger holds for lifting the doors. And finally, I attached the lock-out hinge arms so that I could open a door and the arm would hold it open. That’s it, voila, instant truck bed storage and sleeping platform! The last part is the hardest part. The unit is a little heavy so setting the platform in the truck bed may require some assistance. But if built to the right measurements, it will slide right in between the truck wheel wells as mine did, not to brag or anything. Making the unit with 8 compartments makes it stronger for sleeping on top. 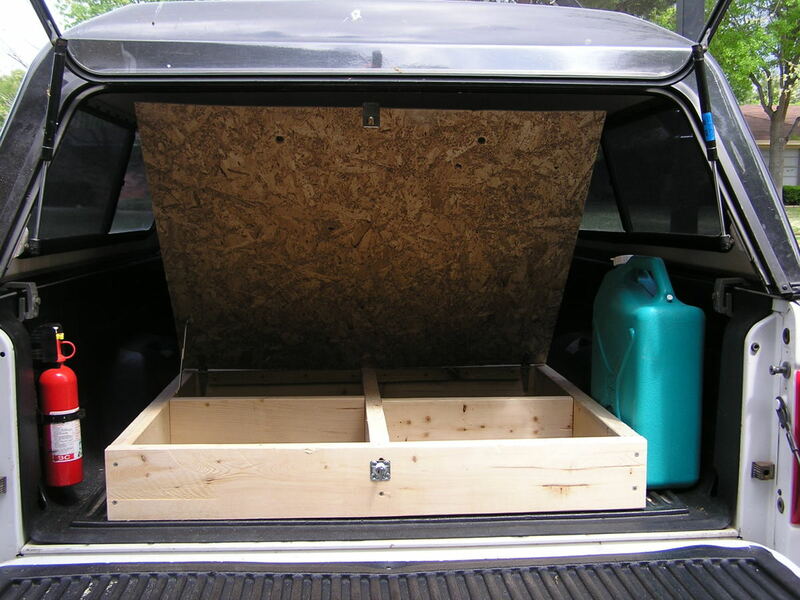 Leaving only 4 compartments leaves too much room for the thin plywood to droop. I used thinned plywood since I wanted to make this thing as light as possible but thicker plywood will work if you want extra support for the sleeping platform. Mine has 4 small separate cubby spaces due to the wheel wheels but these work fine for storing other items like a water jug or gas can. So that’s it. 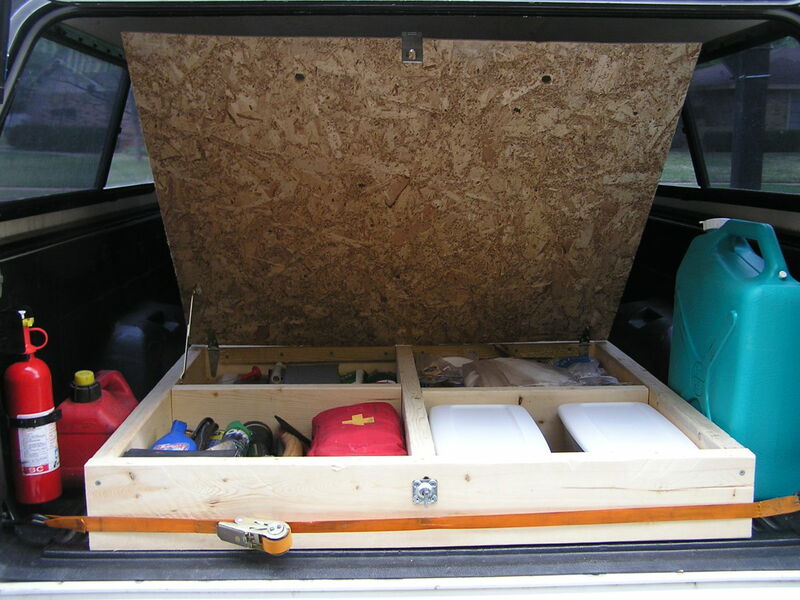 Store all you gear inside the box (I put the least used items in the back 4 compartments and items I use frequently in the front 4 compartments for ease of reach), close it up at night, roll out your mattress, and sleep on top. Mine sleeps two people or should I say my dog and me. There’s no need to spend time setting up a tent or stabilizing an RV. It’s a secure, simple way to camp. Just pack and go! Happy camping! I have a Chevy S-10 and picked up a used topper a few months ago. I made my sleeper similar but used three 2 x 8's running the length of the bed with three 2x4's running across and covered with 1/2" plywood. This left me about 7 1/2 inches under the bed for storage. I have 6 plastic boxes purchased at the local Dollar Store which slide under the bed. A rope on each of them allows me to slide them out as needed. One advantage is that each has a separate lid. I covered the plywood bed with 2 layers of half inch rubber mat usually used as a flooring in a workshop. Over this I have a moving blanket and a sleeping mat. I found the an air mattress raised the bed too high. I had a 275 watt inverter so I added a 6" fan and also added a DC heater run off of the cigeratte lighter. Curtins are shop towels adheared with carpet tape. I also have rod holders for 6 fishing rods, plus 2 battery operated lights. The whole unit slides out if I want to revert back to a normal pick-up. Haven't used it yet but looks like its gonna work fine. It's been fun building it. I see the guy with the Tacoma on bajataco.com used carpet. I was planning to do this with mine but I wanted to keep my costs down for this project. This guy did something similar as well when he camped out in Baja with a Toyota Tacoma. Gears are turning for my own truck. Very innovative. Kudos to you! I've never done this type camping. However, I had some friends that drove cross country a few years ago camping in their truck. Looks handy that's for sure! Great way to camp in style. What a great idea and I bet it is warmer than just a mattress on the box. That is awesome design, I will probably do the same. I might alter the width and make it so I can have a platform over the wheel wells. I'll get measuring first to see if that is what I want. I love this hub. Just what I needed. We have been camping for over 25 years in a tent. Now I'm getting old I don't want to sleep in a tent anymore. Hubby going to make a camper out of a van. Simple yet more comfortable than a tent. Especially when it's raining.